Put in its simplest terms (more detailed information is further down the page), cash ISAs are savings accounts any UK adult can use to deposit up to £20,000 per tax year in, on which no tax is payable on the interest. Once you have put your money in, it continues to retain its tax-free status into the future, so you can, over the years, build a significant ISA balance, but if you don't use a year's allocation you lose it. You can have ISAs with any number of institutions, but you can only put new money in to one cash ISA per tax year. You need to be 16 or over to have an ISA. With an ISA you can save up to £20,000 in the 2018/19 tax year and not pay UK tax on the income you receive from your investment. For cash ISAs, you can only invest with one provider in any one tax year, but can have many different providers if you have held them over a number of years. You can hold a cash ISA, or a stocks and shares ISA (one that is invested in stocks and shares traded on the Stock Exchange). You can only invest £20,000 in total in the tax year 2018/2019 between the two types of ISA. 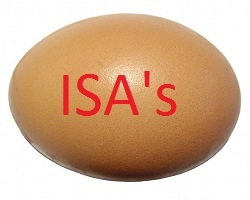 You can transfer your cash ISA to another ISA manager, either into another cash ISA or into a stocks and shares ISA. Since the tax year 14/15 you can now also transfer your stocks and shares ISA to another ISA manager, either into another cash ISA or into a stocks and shares ISA. You are able to transfer some or all of the money saved in previous tax years without affecting your annual ISA investment allowance. If you have any questions about the tax rules for ISAs call the Inland Revenues ISA Helpline on 0845 604 1701 (Monday -Thursday 8.30-5.00, Friday 8.30-4.30) making sure you have the information about your ISA available. Where bonuses or limited time offers apply, remember to make a note to review the rates available to you on expiry, as often the underlying interest rates are not competitive. We source our data through newspaper best buy tables, information from providers and more importantly from consumers such as yourselves - if you feel you have found a rate we should be talking about tell us here.